This article doesn't mean that you shouldn't discuss your salary. Every hiring manager knows that the candidates expect a good salary and growth, but this is not the right time to discuss your financial needs unless they don't ask you to tell. 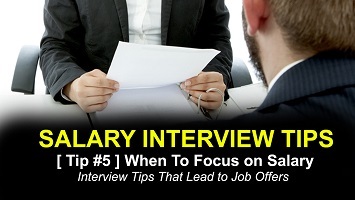 Salary may be your first priority, but it is not the most critical factor during a job interview unless you aren't going to discuss factors like your responsibilities, expectations, growth trajectory - short term and long term. Sometimes your hiring manager asks salary related question after asking "Tell me About yourself", but remember they are checking whether you seriously want the job or just a monetary transaction. You need to tell them you want to know more about the position and responsibilities before discussing salary related questions. Being employed is very much “the more you put in, the more you get out”, so stay calm until you hold the job agreement paper in your hand. You’ve worked hard to perfect your resume and land for a job interview. This is an opportunity to impress your interviewer by highlighting your strength, achievements, and past experience. Failing to get an offer that’s sufficient to support you or your family makes you frustrated and disappointed because nobody wants to be in a position where they realize that the salary isn't enough after they have accepted the job offer. There is a salary-related question during the interview, for eg. "how much salary are you expecting? ". If you are asked, then it usually indicates that there is some interest in having you come to work for the company. This is the time to open your mouth, but before you need to take a deep research on market value (Payscale.com /Glassdoor.com/ Salary.com) to understand the market salary range for the position or how much they are offering to other candidates. Interviewers ask this question to ensure that they can afford you before handling a job agreement paper. So, before you reach the point of salary negotiations, sell them on you, and convince them of your worth to their organization. While answering salary related question, you shouldn't delay in giving your answer. If you do so, then you’re letting the hiring manager know that they’re getting a tough negotiator if they hire you. Experts suggest that you give a salary range, rather than an actual number.